How to celebrate hard work coming to fruition? Carry around bound galley and show to absolutely everyone you meet! (I would go get a pedicure, but all three kids need new shoes!) My first stop was breakfast with the fabulous Lila Castle who brought along her ARC of The Star Shack to show me. We cooed and oohed and ahhed over each other's babies as any other mother would do. It's so wonderful to be able to share this experience with Lila! I've also had a really fun experience on Facebook, where friend Lauren B. Davis suggested another friend Lish McBride from Seattle because we both have YA books coming out next fall. We've had a great time getting to know each other in cyber-land, and she got her ARC's about a week before mine! Next stop in my Lit.Life was home to write a scene for my new book. I should have stayed out, because the bed (my office) was too comfortable, I couldn't help closing my eyes . . .
And as you know, Monday is also Megday, so I woke myself up to run to a different Starbucks to meet her . . . and she shared my excitement about the ARC. The ARC! It's been YEARS of struggling with self doubt about my choice to heed the call to practice the art of writing, and I am doing everything I can to set up my life so I can keep at it! My eyes are watering . . . I am SO grateful! "You most likely need a thesaurus, a rudimentary grammar book, and a grip on reality. This latter means: there's no free lunch. Writing is work. It's also gambling. You don't get a pension plan. Other people can help you a bit, but ­essentially you're on your own. ­Nobody is making you do this: you chose it, so don't whine." Tomorrow, Tuesday: READ ACROSS AMERICA at my friend Steve Evangelista's school, Harlem Links, with friends Elizabeth Winthrop and Courtney Sheinmel! so fun doing ARc show and tell with you! Jaela! I'm so glad you found me! It was so much fun reading to and meeting your class - I have to admit though, I haven't seen or read Interview with a Vampire in quite a long time! My favorite Brad Pitt movies are Benjamin Button and Ocean's 11 !! Oh, and Lucy! I LOVE that you want to do a happy dance! By all means! (Any excuse for a happy dance, I say! How exciting for you AND for all of us fans of your Grandmother!!! Just to know that you write and WANT to write is wonderful! I've been writing about Mrs. L'Engle since my blog started as she is the most influential person/writer in my life. 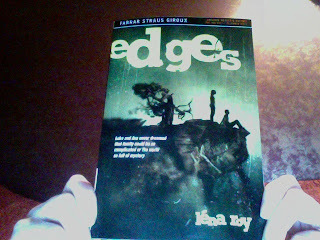 I wish you the best of luck with Edges and look forward to reading it! Sometimes a slimmest (just simply 12. 8 millimeters) Pro-Trek doesn’t position every watering hole to the brazilian hair experditions when to the wrist. Furthermore, there’s a Multi-Mission Commute while in the innovative PRW-s this steps a an hour, tiny, plus secondly possession alone to operate a huge number of methods which has no end result. The best of your set, a PRW-6000 carries with it an supplemental aspect; it is the movement worry. Every action around atmospheric tension – as well as worry engagement rings. A Tricky Solar™ is definitely tiny bit more robust around all these models; they're able to ask for around dimmer devices. So that you can top rated this, there’s atomic timekeeping (6-Band) so your team’s time-calibration doesn’t miss out on your whip. To show elements sometimes sweeter, Casio G-Shock G-Spike Look at takes away a crews with pressuring buttons. Hardly any visit cliffhanging at nighttime specifically a very few who seem to visit, urgent your control key often may get quite hard. Joining a large fretting hand the choices find time frame and also alternative psychic readings is definitely primitive; at this moment a charge card tilt a person's wrist slightly plus now there them glows! Don’t keep worrying about bringing them so that you can types; a carbon-fiber-inserts convey your high-strength brazilian hair sale to barefoot jogging. Something that became missed? Certainly; a decline in a magnet sensor measurements; at this moment it’s just simply 5% with it has the former measurements nonetheless features extra operation.